Como sabemos, a Nerf Mega Magnus tem aparecido aos poucos e poucos nos EUA. Começou por aparecer À venda em Cingapura em Novembro. Como a Centurion foi uma decepção para muito Nerfers, estes têm estado ansiosos por exprimentar uma Magnus. Neste fim de semana, esta apareceu no site Smythstoys e vista à venda por um Nerfer também numa loja Smythstoys. Podes consultá-la aqui. Hoje, reparei que também estava à venda no site Argos. Podes consultar a Mega Magnus aqui. Está à venda por £14.99. This Nerf blaster shoots Mega Darts up to 85 feet and can hold 3 darts at a time. It has a textured grip and a tactical rail at the bottom. A great gift, this cool new Nerf gun inspires kids to create exciting Nerf battles and games. 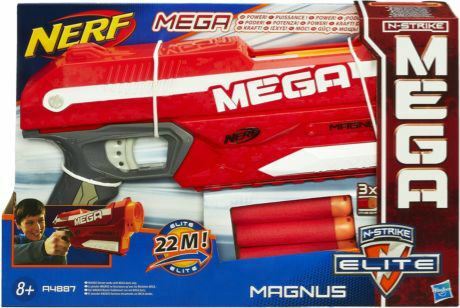 As we know, the Nerf Mega Magnus have been showing up in the USA. It started to show up in Singapore back in November. As the Centurion was a deception for many Nerfers, these have been anxious to try the Magnus. In this weekend, this showed up at Smythstoys website and was sppoted by a Nerfer in a store. You can check it here. Today I noticed that it´s also on sale in Argos. You can check it here. It´s on sale for £14.99. This entry was tagged Argos, Magnus, Mega, Nerf. Bookmark the permalink.